Late night Christmas shopping can be quite an event, particularly in the Children in Distress thrift shop in Guisborough, where manager, Tracy England pulls out all the stops, welcoming local children and their families to visit the charity’s very own Father Christmas. Santa, even has his own specially bedecked grotto where he sits ready to welcome the local kids with kind words and little gifts. For some, meeting the ‘real’ Santa Claus is the highlight of the year, for many of the kids it’s a memory to treasure, just as it was for their parents, who in fond memory, bring their offspring back year after year. 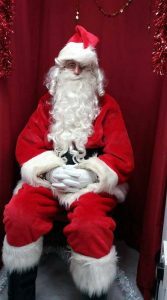 Santa or his local alter ego, Roy Wheeler, is normally in great demand and very busy at this time of the year for as the inspiration of CID’s Christmas Shoe box Appeal, he is in great demand and seems to be everywhere at once. Over the last two or more decades Roy must have spoken to hundreds of school assemblies , attended untold numbers of gift box dedication services and personally collected hundreds of thousands of shoe boxes from donors across the UK. For many years, Roy and his ever ready helper, Eddie Errington, personally uplifted stacked and packed hundreds of thousands of the closely packaged gift boxes. Roy was even known to get behind the wheel and even drive traction units and trailers though winter storms and snowdrifts to see donated boxes got through and were delivered, safe and sound, ready to give out to the kids and senior citizens who needed them most. Sadly, this year for the first time in a decade ill health has forced Roy to stay at home but his understudies are already out pounding through snow drifts making sure the all that’ love in a box’ from those who care in the UK is delivered to those children and senior citizens who need to know that they are cared for.